"ChiHawks Sign Hot Finland Goalie Prospect Antti Raanta"
I can see penguins going down in 4 with that mess they have in goal. They must have some team to get this far with that pair. Right up there as one of the best games in Boston sports ever. Tuukka was unreal. Jagr was possessed and the Bs oldest player might have been the Bs best player late in the game. And what can you say about Gregory Campbell (word this morning is that the leg is broken). Now gotta get that 4th win, the hardest game to win in any 7 game series. Go Kings! Make it two in a row tonight! well last night the hockey gods were on Bostons side. I am so glad bruins are winning and i dont even root for the Bruins. That being said, Pittsburg outplayed them by a ton through the first overtime. I went to sleep and did not see the 2nd OT period but Tukka was on fire and the Penguins did everything but score all night long. I would love to see Boston sweep and that guy Campbell was amazing hobbling around on a broken leg for about 2 minutes. Holy crap!!!!! No Keith tonight but still have faith that the Hawks are going up 3-1. Drop of the puck in a few minutes. The HNIC guys are so behind LA it's almost funny. Great game last night and love the Bruins winning. Would love a Chicago vs Boston Final. A few fans of both teams on here makes it even more fun. Black Hawks! One more game to the finals. Kept LA to two shots in the third. One step closer to an all O6 final. For some reason a 3-0 lead makes me uneasy. Bs need to finish off the Pens tonight. i agree, Boston cannot let Penguins into the series and need to close it out tonight. Penguins are still dangerous with that lineup. Boston did an awesome job and took them out. Love it as I don't like teams loading up. On to the Finals for them. Unfortunately that is as far as I can cheer Boston on. The last minute or so was insane and Boston was just lucky. That save by Chara's hand was an absolute fluke. I can't believe that Malkin didn't drain that. The Bruins were running around like headless chickens with bodies flying everywhere. That is NHL Playoff excitement at it's finest. The hockey gods were on their side tonight. Now just need Chicago to finish with LA quickly and not let them back in for a longer series. The less wore out the better. So if the Blackhawks win it all the series clincher will go into 3 OT's, right? Oh boy, this is going to be fun. Two O6ers going at it for the best trophy in sports. Hang on and have fun. I'm watching the local ABC news in Chicago. They had this lady live from the United Center where the Blackhawks play. She said the Hawks now move on to play the Boston Brewers. I can't stop laughing. 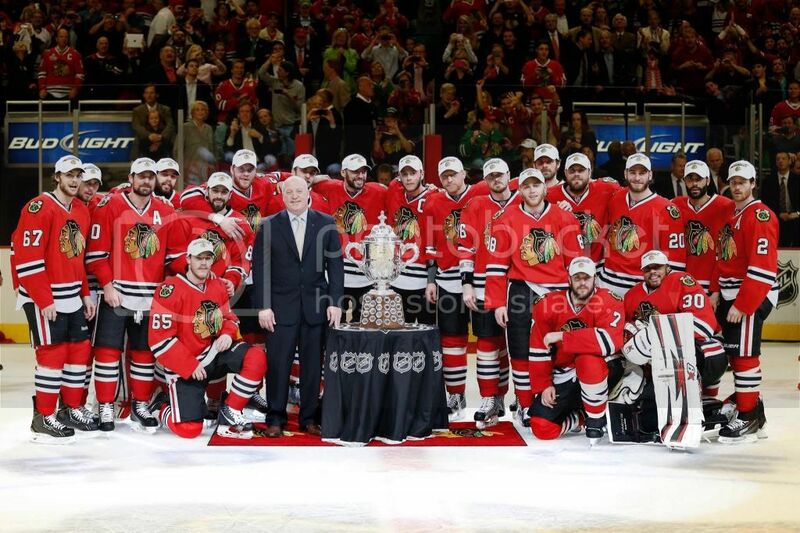 In the words of Dennis Savard "commit to the Indian" .. should be a fun series ..
Nobody would touch the Western Conference trophy ..
Hard to believe that these two teams have never met for the Stanley Cup. After all these years and it will still be a first time event. Amazing. Gonna be great. The Hawks are not gonna be pushed around like the Pens were. May not be able to bring back Tony O, Stephen. But the Hawks are the NHL's Top defensive team and were 2nd in offence. That is a combo the Bruins have yet to face. The wait until Wednesday has begun. And I HATE the extra day off after each of the Wednesday games. Once it starts, games should be every other day until one team wins 4.